According to Fr. Alexei, the meeting “gave him an opportunity to thank the Metropolitan for his love in Christ and concern for them and thank the Fund for Assistance and all the donors” for supporting the mission at a terrible time of the earthquake and continuing desolation. In speaking to Fr Alexei, +Metropolitan Hilarion told him that ROCOR will continue to support him and the Orthodox communities in Chile through prayers and financial support, “as much as we are able”. “We need to remind the Orthodox community worldwide of the needs of Fr Alex who at the present receives no remuneration for his teaching at the local college. The only monetary support he receives and by which he and his family survive is through the Fund for Assistance,” he said. According to Fr. Alexei, the value of the Fund’s support at the time when continuing unemployment in the wake of the earthquake is felt more and more in the community, is priceless. “The help of the Fund for Assistance is all we have,” said Fr. Alexei. Many parishioners do not have a source of income, and are in need of such simple necessities as food, clothes, as well as money for education and medicine. “With your help we will have a smile on our faces and quiet in our hearts, so necessary to give testimony to our Lord and to share spiritual and cultural treasures of our Russian Orthodox Church with others,” wrote Fr. Alexei in an email. 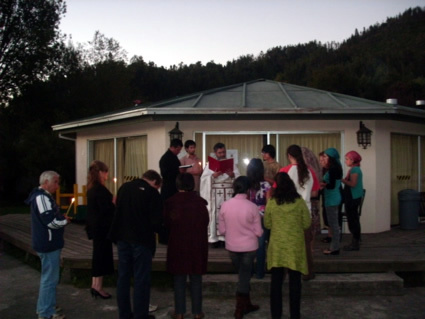 Father Alex is the only ROCOR priest in Chile and ministers to three communities of our Church in Chile in Santiago, Concepcion and Valdivia. He teaches at the Valle Central Institute in Concepcion. Aftershocks continued to hit Chile long after the earthquake on February, 27. As recently as Friday, April 23, Chile was hit by a 6.1 magnitude earthquake near Concepcion. No damage or casualties have been reported.